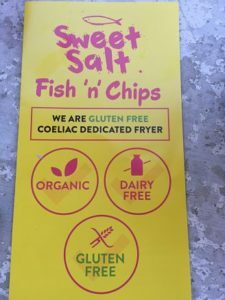 Sweet Salt is a modern family run fish and chip shop with a focus on gluten free and other dietary requirements, such as dairy free and vegan. 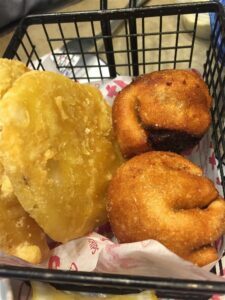 There is a gluten free family member that triggered the focus on gluten free and it has become a popular venue, recommended by many coeliacs around Melbourne. 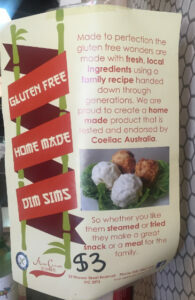 Sweet Salt were accredited by Coeliac Australia in May 2018. 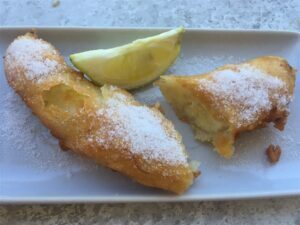 The food all tastes great – crispy fish batter and well cooked chips and potato cakes – it is amazing for coeliacs to indulge in potato cakes and dim sims, a rare thing even for fish & chip shops that have gluten free batter for fish. We often get the Gluten Free BFF pack (see photo below), so we get a bit of everything. This costs $32.90 (2018) and includes 2 sauces (this would cost around $40 if ordered individually). There are also fresh gluten free salads available, such as coleslaw and greek salad. They have a dedicated coeliac fryer and you just need to say you require gluten free when placing your order. 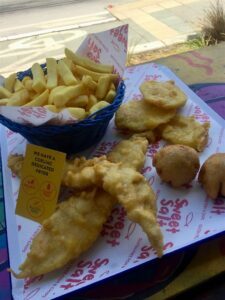 As well as the options outlined above, you can also have scallops/mussels/prawns/calamari, burgers (with a gluten free bun), fish bites and chicken nuggets etc. Everything is marked up on the menu board as well as the takeaway menus. There is plenty of room to eat in, as well as two long bench tables out the front. We usually take our dog with us and sit outside and people watch. 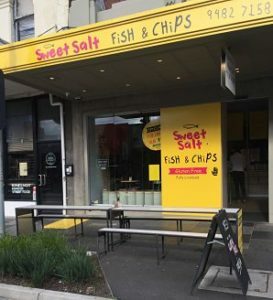 If you are taking away, there is a rear entrance on Frederick Street to collect your order.